The Russian cable channel caused a stir after it ran a poll that critics said offended Russia’s national pride. The Russian cable channel Dozhd (Rain) has found itself at the center of a scandal after it polled its audience on the World War II Siege of Leningrad (now St. Petersburg), drawing criticism from the authorities and society, who saw the questions as offensive. Some TV providers took the channel. Leningrad remained under siege for nearly 900 days from September 1941 to January 1944 as Nazi troops surrounded the city, cutting off critical food and energy supplies. More than 1.5 million people died during the siege. According to Ilya Klishin, the chief editor of the Dozhd TV website, the poll was taken down as soon as he noticed it. The question sparked a wave of criticism. On Thursday, January 30, the St. Petersburg prosecutor's office launched an inquiry into the channel on suspicion of extremism. The day before, on January 29, cable networks began taking Dozhd TV off their channel packages, citing economic reasons. A press release posted on the website of one provider, Tricolor TV, said "the inadmissibility of insulting the feelings of veterans" and expresses "extreme concern at the fact that [Dozhd TV] organized a poll that, in essence, calls for a re-evaluation of the impact the Battle of Leningrad had on World War II." Tricolor TV described as unacceptable "the black-mouthing of the glorious pages of Russia's history and of the Soviet people's courage on the battlefields of the Great Patriotic War, and of the memory of the Great Victory." Dozhd channel’s editorial team argued that the poll was just a pretext for reprisals against the channel, and said they did not want to insult anyone. "I am convinced that we did not break the law; we did not want to offend anybody but extend our sincere apologies to everyone who took offence," said Dozhd TV Chief Editor Mikhail Zygar. General Manager Natalya Sindeyeva remarked that the channel had first encountered rebroadcast problems after it aired a program about out-of-town villas belonging to top-ranking state officials. By the evening of January 28, after Dozhd TV had been taken off air by three cable networks, Russian viewers started demanding compensation for the signal loss. Since its launch in 2010, Dozhd TV has built a reputation as a platform for heated debates on pressing topics. Its viewers are mostly active Internet users in major Russian cities. Around two-thirds of all programs are first broadcast live and then repeated. Lyudmila Alexeyeva, the head of the Moscow Helsinki Group, one of Russia’s oldest human rights groups, said she believed that Dozhd TV should be allowed to continue operation. "It was quite a difficult question, the topic may indeed be fairly sensitive. But criticism is quite enough if someone feels offended," she said. TV presenter and historian Nikolay Svanidze commented that taking the channel off air was unacceptable, and despite the sensitivity of the topic, Russian society should apply critical thinking to discussing its history. "As a historian, I do not believe that we don’t have the right to discuss World War II in this light. We should know the truth not only about Hitler, but also about the actions of our own government,” he said. “Why wasn't the civilian population of Leningrad evacuated prior to the siege, why weren't supply lines set up? Up to 1.5 million people died there, but who is to blame for this? Germany is not afraid to hear the truth about its people but this does not diminish their self-respect. Our government also has a thing or two to apologize for. Did we really need all these sacrifices?" 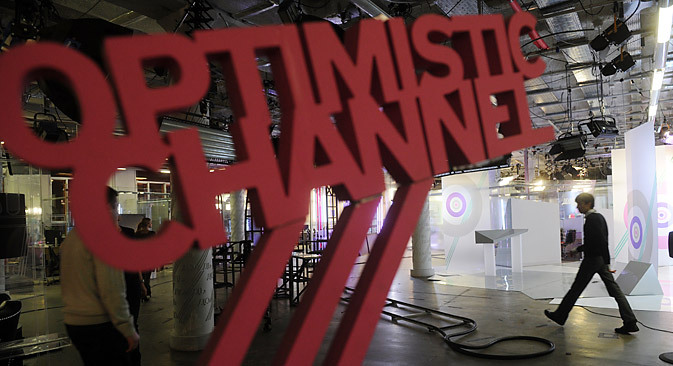 Svanidze is convinced that the poll cannot serve as the ground for taking the channel off air. "History always splits societies, but Russian society is happy to split at any opportunity, be it a historical topic or even an evaluation of current events. If the channel gets taken off air so suddenly then politics are involved. The poll was just the pretext; I have no idea about the true motives behind this. Let's hope the conflict will get resolved." Pavel Salin, director of the Center for Current Politics at the Finance University said he disagreed. "The Russian people's attitude towards the Great Patriotic War is a fundamental value which holds society together. This attitude became especially evident in the 1990s, when the government used it as the foundation of its policy,” he said. “Today, there can be no challenging of this position. Differing historical viewpoints are unacceptable. I believe this to be justified, because [the Soviet Union's role in World War II] must be presented to laypeople in a positive light." Salin noted, however, that the Dozhd TV audience was too small for any serious social repercussions. "The Dozhd TV poll did impact on the consensus in society. The question was wrong. If one of the federal TV channels posed it, this would result in a massive public scandal. But Dozhd TV has a fairly small and specific audience, and the poll was simply used as a pretext for applying sanctions to the channel." Valentina Matviyenko, the speaker of the upper house of the Russian parliament and former St. Petersburg mayor, said she was deeply shocked by the poll. "I cannot fathom how such a question could have possible been put on the eve of the 70th anniversary of the [lifting of the] siege," she wrote on her website. Matviyenko described the poll as sacrilegious, but said she would not like for the channel to be closed over it.